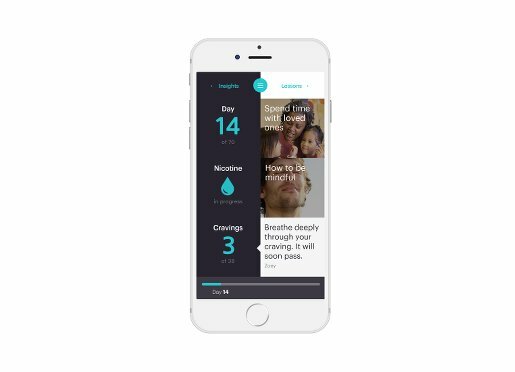 The company’s wearable smoking cessation device enables users to log cravings and tides them over with algorithm-dosed nicotine. Chrono Therapeutics's wearable device provides timed transdermal nicotine delivery and logs users' cravings. The skin patch is an established and proven tool in nicotine replacement therapy, but it still has limitations. Strongest right after it is first applied to the skin, a nicotine patch’s waning potency later in the day can lead smokers to relapse. Hayward, CA-based Chrono Therapeutics is using medical technology to modernize traditional approaches to smoking cessation. The company has developed a way to provide timed transdermal drug delivery via a wearable device. Paired with a mobile application that promotes behavioral changes, the device will offer a better way to wean smokers from nicotine cravings and help them kick the habit, according to the company. The Chrono device pairs with a mobile app to offer coaching. Like the Chrono device, the company represents a combination of technologies. Chrono’s 30 employees bring backgrounds in medical devices, pharmaceuticals, IT, and design. But from its beginnings, the product concept was always a wearable technology, said Jenny Hapgood, Chrono’s vice president of product management and marketing. Guy Dipierro, Chrono’s founder and vice president of government affairs and intellectual property, originally envisioned drug delivery from a wristwatch-type device. He was moved to develop new smoking cessation technology about 10 years ago, following a lung cancer death in the family, Hapgood said. Early on, Dipierro partnered with the University of Basel in Switzerland for research and development. Dipierro eventually met Alan Levy, who as the CEO of Incline Therapeutics oversaw development of a patient-controlled transdermal device that administers the painkiller fentanyl. The Medicines Co. acquired Incline in 2013, and the following year Dipierro and Levy formed Chrono. By then, Dipierro’s original design had evolved into a wearable device applied to the arm, leg, or torso. About 18 months ago, Chrono added behavioral support through a mobile app. The combination of those technologies sparked investor interest, leading to a $32 million Series A round led by Canaan Partners and 5AM Ventures with participation from Fountain Healthcare Partners, GE Ventures, and the Mayo Clinic. Smokers prepare the device just before bedtime. A cartridge inserted into the device holds enough nicotine to last the following day. The user enters his or her wake time into the device, which is affixed to the body with an adhesive. The device is designed to begin administering nicotine 90 minutes before the scheduled wake time, which snuffs out the first cigarette craving of the day. The Chrono device administers additional doses throughout the day according to a pre-programmed algorithm. The device does not have sensors to measure and respond to nicotine levels in individual smokers, though Hapgood said the company hopes to eventually add functions that precisely time nicotine delivery to a user’s peak craving. In the current design, users can press a “crave button” when they feel a smoking urge. The app responds with motivational coaching—notifications and videos—and also tracks crave patterns by recording each crave button push. Information about crave patterns can help users change behaviors that contribute to smoking urges, Hapgood explained. Gerald Klein, a physician and principal at Raleigh, NC-based medical affairs services company MedSurgPI, sees promise in Chrono’s technology. Klein previously worked with nicotine gums and patches as an executive at a contract research organization, where he saw patient compliance as the biggest obstacle for smoking cessation products. Klein, who has no connection to Chrono, said the company’s innovation is the combination of technologies that together should improve compliance, particularly for younger smokers. Chrono has tested prototypes in two small clinical trials that showed the device delivered the nicotine and worked as intended. Larger clinical trials evaluating the technology’s efficacy are planned for 2016 and 2017. Chrono still needs to meet with FDA to discuss the design of these trials, which will require additional financing, Hapgood said. Chrono will seek FDA clearance for the product as a drug under 505(b)(2), using the nicotine patch as its reference device. If Chrono clears that hurdle, the company plans to market the device over the counter, “sitting on the shelf next to the patches and next to the gum,” Hapgood said. If FDA clears the device, the company believes health insurers will cover the product. That paves the way for Chrono’s long-range plan—commercializing a device that offers timed transdermal drug delivery for a wide range of conditions that require a way to manage the peaks and valleys of a patient’s drug levels. Network with your medtech industry peers at the MD&M West conference and expo, February 9-11, 2016, in Anaheim, CA. Frank Vinluan is a frequent contributor to MD+DI. Reach him at [email protected]. Correction: An earlier version of this article incorrectly named Foundation Healthcare Partners as a participant in Chrono Therapeutics's Series A round. The firm's name is actually Fountain Healthcare Partners. The article also incorrectly stated that Chrono Therapeutics will seek 510(k) clearance for its device. In fact, it will seek clearance for the product as a drug under 505(b)(2).